‘Ireland has changed its name to Eire and its charming people, whose qualities of heart and mind were so cruelly misused for so many centuries, are busily making a nation, but it is still the Emerald Isle of nineteenth-century literature, exaggeratedly itself,’ Nancy wrote of Ireland in The Water Beetle, a small book described as a ‘salad of well seasoned essays’. After the austerity of war-time Britain, Ireland was a demi-paradise for Nancy and her sisters; there was no rationing, and the rich – such as Pam and Derek Jackson – could set up residency to avoid the super taxation of Attlee’s Labour Government. Every spring, Nancy boarded the Aer Lingus Friend Ship plane at Le Bourget destined for Ireland. She praised its customer service in an age when travelling by aeroplane was becoming commercial and the rule of the day was ‘don’t spoil the passengers’. However, the Friend Ship, to Nancy’s delight, aimed to please. There was a delicious luncheon of hot soup, fresh salmon and hot coffee, after which the passengers settled down to enjoy the headlines of The Irish Times and The Cork Examiner: ‘Dublin Nun Found Dead in Drain’, ‘Priest Hurt in Collison with Cart’. It amused Nancy that every village and small town seemed to have a luggage shop, for she wrote: ‘People leave Eire as they have always left Ireland, at an enormous rate.’ The country roads were empty, although the occasional Rolls Royce with American tourists buried in white satin luggage came lumbering down the road, and the cottage dogs, so unused to motor traffic, dived at passing cars. The shops in rural villages were a dream for Nancy, who relished the fact they had no modern boutiques, and she bought a year’s worth of cotton dresses and nylons. Medical Hall sold French cosmetics and scent, so naturally that was heaven on earth for her. She noticed an exciting new sign advertising ‘Modern Hairstyling’, and learned of two young ladies, trained in New York, who washed hair backwards. The young ladies, however, seemed to have lost their transatlantic hustle, and although it was half past eleven when Nancy rang the doorbell for an appointment, the receptionist was still in her dressing gown. ‘Eire does not live with the times,’ she concluded. And, by her own reasoning, she realised English historians had no notion of the country, and could only represent a strange flock of people living on a fairy-like island. ‘This is not good enough,’ she warned, and she hoped a young genius would begin a great History of Ireland. The above was detailed in Nancy’s essay ‘The Other Island’, published in The Water Beetle. There was nothing exceptional about Diana’s encounter with Adolf Hitler when she met him on the 11th March 1935. Summoned by Unity, who succeeded in befriending the Fuhrer and worming her way into his inner-circle, Diana flew to Paris, collected the elegant Voisin Oswald Mosley had bought for her, and motored to Germany. The events, before she encountered the Fuhrer, seemed far more memorable when she became stranded in heavy snow in the Black Forest and a passing peasant and his horses pulled her to safety. Upon entering the Osteria Bavaria, Hitler’s favourite restaurant in Munich, Diana discreetly remarked, ‘Look at him [the Fuhrer] in his mackintosh.’ From that low-key impression, she observed he ‘appealed in equal measure to women and to exactly the sort of men he needed’. At the time, Diana could not speak German aside from a phrase or two, and she relied on Unity to translate. Although, on that particular day, there was more silence than conversation, and they stuck to polite small-talk. She claimed that she never heard Hitler rant, or go off on a political tangent. However, the year before this meeting with Hitler, Diana had indeed witnessed his s showmanship in person when she and Unity visited Munich on a whim because Putzi Hanfstaengl, a friend of her former in-laws, promised to introduce them to the Fuhrer. Having exaggerated his accessibility to Hitler, he produced two tickets to the Parteitag, and later refused them entry to Hitler due to their heavily made-up faces. ‘I can’t do without my lipstick,’ Unity said. A year had passed since this false start, Unity had moved to Germany, and during a visit from Diana they looked up Hanfstaengle ahead of the second Parteitag, but he was less than accommodating and claimed to have no tickets. Having gone to Nuremberg, both women discovered the town was overrun by Nazis and their supporters, and faced with the realisation there were no hotel rooms and no tickets, Unity spied an elderly man wearing a special badge. The badge in question indicated he was one of the Nazi Party’s first members and, schooled on all things to do with Hitler, Unity approached him and confided their misfortune. He duly located a room and found two tickets. They went to the Pateitag, now an elaborate militant display with special effects and blood-and-thunder music. She was lost in translation, but Hitler’s passionate delivery and the crowd’s enthusiasm inspired her to relay his mass appeal to Mosley, whose party was beginning to flounder. In the near future, when she learned German, Diana understood Hitler’s message, it was clear to her, whether she believed it or not, just what he had planned for the Jews when he spoke of his Nuremberg Laws. She overlooked the rampant antisemitism of the speeches to focus on his aspirations for a great and powerful Germany, just like Mosley envisioned for Britain. She was, as her biographer Anne de Courcy wrote, very good at closing her eyes to anything she did not wish to see. So, from the very first meeting on the 11th March, Diana dissociated Hitler-the-madman from Hitler-the-person, and it was the latter she claimed to have been fond of. During the visit, Diana observed Hitler had simple tastes, apparent over luncheon at the Osteria Bavaria when he ordered ‘eggs and mayonnaise, and vegetables and pasta, and compote of fruit or a raw grated apple, and Fachingerwasser’. Diana was further impressed by his European manners: he kissed her hand, bowed his head and did not sit down until she was seated. This, she felt necessary to mention in her autobiography, A Life of Contrasts, given the ‘acres of print about Hitler in which his rudeness and bad manners to everyone are emphasised’. 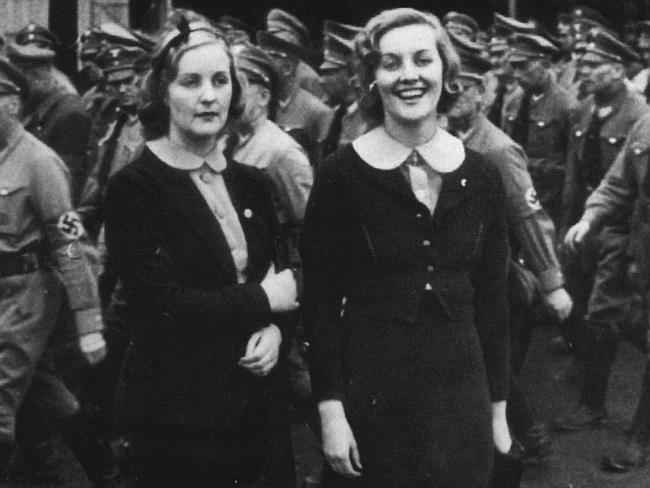 Hitler fascinated Diana with his greyish blue eyes, so dark that they often appeared brown and opaque, and like those who possess sinister intentions, he charmed her. The charm was in abundance; he admired Unity and Diana, the latter in her chic Parisian clothes. And, unlike many in his company, the sisters were not intimidated by him and they conversed freely, often punctuating their sentences with Mitford jokes and witty nuances. To dispel the myth surrounding Unity’s head-over-heels infatuation with Hitler, Diana wrote: ‘Unity was never awed in her entire life. She said what came into her head.’ It was this candour which made the Fuhrer laugh, and in return,‘he inspired affection’. After the short stay in Munich, Diana and Unity drove to Paris, each taking turns to drive the Voisin. Paris never appealed to Unity the way it did to Diana, and after exhausting the museums and galleries, she left for Germany. That brief meeting, eighty years ago today, marked a watershed moment in Diana’s life and the decisions that would ultimately seal her fate. Unity, the channel to Hitler, spoke glowingly of Mosley and his British Union of Fascists. When she reported that Hitler showed an interest in meeting Mosley, Diana jumped at the opportunity to form an alliance between the two men. It does not take a genius or a well-versed Mitfordian to predict what happened next. Evelyn Waugh had made up his mind to dislike Diana Guinness, the third-born and most beautiful of the six Mitford girls. As the young wife of the brewing scion Bryan Guinness, Diana had already established herself as a dazzling society hostess. She was the epitome of what Evelyn (at that time) despised: rich, frivolous and, as he privately imagined, not very bright. 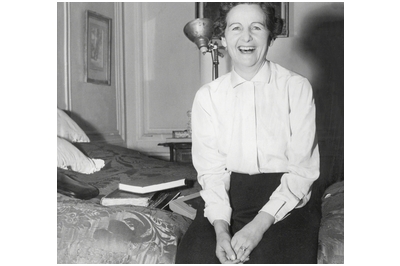 During Evelyn’s years of friendship with Nancy Mitford, Diana had become a phantom presence in his life. He had read about her antics in popular magazines of the day: Tatler, Bystander and The Sketch, and he did not fail to recognise that her celebrity was in ascent – a dizzying element for a girl who had spent her childhood as the scapegoat for Nancy’s teases and vitriolic putdowns. Evelyn himself was plotting his own coup-de-main in the form of a novel that would parody Diana and her disciples. Knowing of Evelyn’s desire to witness this set first hand, Nancy invited him and his wife, Evelyn Gardner (they went by the monickers of He-Evelyn and She-Evelyn), to Diana’s tropical party on board the Friendship, a riverboat permanently moored at Charing Cross Pier. Out of place in the gaiety of the Friendship, Evelyn observed the misbehaving guests dressed in Zulu costumes and in sarongs, as ordinary commuters scurried along the embankment to catch the last train home. From this first evening with Diana, Evelyn felt he had gained substantial material for his novel. But, most importantly, he had achieved his ambition of catching snippets of how the Bright Young Things spoke – “too, too divine”, “utterly sick-making”, etcetera. The bonus, of which, was hearing Diana’s “Mitford Voice” in person with its swooping intonations, the shrillness of her laughter and the private language she and Nancy indulged in. To Evelyn’s astonishment – and his horror – he found himself captivated by her. If, at the age of nineteen, Diana was prone to immaturity her generosity more than made up for this juvenile streak. Since the abandonment of She-Evelyn two days after the celebrated Tropical Party, Evelyn was consumed by the breakup of his marriage. And his depressed demeanour, exasperated by the need to stay at his parents’ house in Hampstead, was proving to be a distraction to his writing. So, Diana offered him the solitude of Poole Place, the Guinness family’s seaside home in Climping, Sussex, as an ideal retreat to finish his novel. Warned by Diana of its “ugliness”, Evelyn set forth to Poole Place in late autumn, undeterred by the freezing coastal winds and the noisy ferocity of the English Channel. Poole Place fascinated him, and he was equally intrigued by the work going on in the nearby fields, where Diana’s mother-in-law, Lady Evelyn, was constructing her vision of a Medieval house. She wanted gnarled trees for the newly built house to nestle in, and they were bought and transferred from afar, carefully replanted in the best soil, bound together in straightjackets of thick straw and tied down with great cables and pegs. The architect, Mr. Phillips, obeyed Lady Evelyn’s strict orders, and he imported squirrels and field mice to give the new trees a touch of authenticity. Eccentricity tickled Evelyn, and the sight of armies of men, lorries and cranes required for the trees was no exception. The friendship with Diana was formed before Evelyn’s conversion to Catholicism, an act which baffled those closest to him. He must have spoken to Diana about his interest in religion, for she remarked to Lord Berners: “Evelyn prays for me.” The phrase struck a chord of ridiculousness, prompting Berners to scoff: “God doesn’t listen to Evelyn.” At this point in their friendship, Evelyn could see no fault in Diana, and if she was prone to a waspish remark, he did not take it to heart. In the summer of 1929, Diana was expecting her first baby, and in the cheerful company of Evelyn and Nancy, the Guinnesses set forth to their flat in Paris, where Diana would begin her dreaded confinement. Although Evelyn confessed to feeling shattered by the unexpected ending of his relatively short marriage, Diana sensed that he showed no signs of heartbreak. He cavorted around the Rue de Poitiers in high spirits, enchanting her with witty stories and doing all he could to keep her entertained. Inside the flat, Diana relaxed in the quiet splendour of watching Bryan, Evelyn and Nancy work on their manuscripts. Evelyn was struggling to meet his deadline for his travel book, Labels. Bryan was composing Singing Out of Tune, the plot inspired by the failed marriage of the Waughs. And Nancy worked on her first novel, Highland Fling. In her fifth month of pregnancy and overcome with fatigue, Diana spent most of her time in bed, reading their work and dispensing critique, whether it was required or not. When she felt lonely, Bryan, Evelyn and Nancy moved their writing stations into her bedroom. But it was hardly an ideal setting, as demonstrated by Bryan when he shook his pen so violently that the ink spattered the delicate silk curtains. In London, the close relationship with Evelyn continued. Diana and Bryan treated him to a birthday luncheon at the Ritz, but as her pregnancy advanced, her social life wilted. With Bryan occupied with his career as a barrister, Diana and Evelyn grew closer, and he succeeded in gaining her undivided attention. It was an unusual set-up for its time, but Diana’s condition made it somewhat acceptable for them to spend so much time alone. Diana had a table installed in her bedroom, and she and Evelyn enjoyed private, though miniscule, supper parties. They went to luncheons at his parents’ house in Hampstead, and took silly little trips to the zoo. All too often, Diana grew bored with the confines of Buckingham Street and she called on Evelyn to accompany her on some “carriage exercise” in her chauffeur driven Daimler. Some years later, Evelyn drew on this unique experience when he wrote Work Suspended. The narrator falls in love with Lucy, the pregnant wife of his friend, who spent her days “lying in bed in a chaos of newspapers, letters and manicure tools”. It was an age suited to parody, and his imagination smouldered with all sorts of silly manifestations. Still, Evelyn peddled on with his novel, naming it Vile Bodies – the title of which became synonymous with the inter-war foolishness of the Bright Young Things. He finished it in time to present the dedication to Diana and Bryan on Christmas morning: “To B.G and D.G” it read. In return, Diana and Bryan gave him a gold pocket watch. Inspired by his plans to stay in Dublin to complete his latest manuscript, a biography of Jonathan Swift (it was never written), Evelyn encouraged Diana to recuperate from the birth of her baby at Knockmaroon, the Guinness family’s country house on the outskirts of Dublin, where they “could have fun”. On the 16th of March 1930, Jonathan Bryan Guinness was born. Evelyn was touched when Diana and Bryan agreed to his suggestion of Jonathan as a name, and he was further elated when Diana asked him to be godfather to her son. 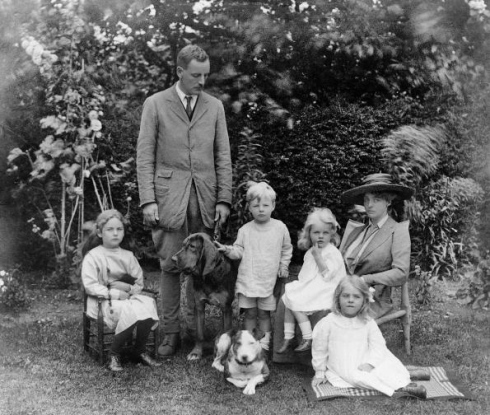 The other godfather, Diana’s cousin Randolph Churchill, became embroiled in a bitter feud with Evelyn – a feud which only ended when death separated the two men. In early summer, London’s social events were in full swing, and with youthful gaiety, Diana launched herself back on the scene. Bryan had reservations about parties, balls, tea at the Ritz and endless trips to the theatre once again consuming their lives. Evelyn, too, disapproved of her eagerness to indulge in such frivolity, and it caused friction between the two. Like Bryan, he preferred to have Diana all to himself, to sit in a quiet corner where they could talk. But Diana, by her own admission, was “pleasure loving”. Evelyn’s jealously transferred on to Bryan, and he was not happy when Diana began passing over his luncheon invitations in favour of her husband, with whom she dined at the Savoy Grill during his afternoon break from his barrister duties at the Temple. Four days after recording the last event in his diary, Evelyn avoided Diana at Cecil Beaton’s cocktail party. It pained her when he did not lapse into their old, familiar rapport and he simply bid her goodnight and left. Diana must have featured heavily on his mind, for later that evening, Evelyn sent a letter to Buckingham Street. His bad behaviour, he wrote, was due to his unease with himself, and the parting words “don’t bother to answer” left Diana with little doubt as to how she should proceed. His petty behaviour enforced her firm belief that “in friendship there must be neither possessiveness nor jealousy. Either would wreck it”. Thirty-six years later, a month before his death on the 10th of April 1966, Evelyn offered Diana some closure when he wrote to her, shouldering the blame for the ending of their friendship. He broke it off out of “pure jealousy”, provoked by an infatuation with her. She had shown him kindness and empathy during a turbulent time in his life, and this inspired him to see Diana in a romantic light. She had become the “unobtainable object” of his desires, and even though a sexual relationship was off limits, he wanted her all to himself as an “especial confidante and comrade”. That, as Evelyn told her, was “the sad and sordid truth”. Except for his letter, they never spoke again. Abridged extract from Mrs Guinness: The Rise and Fall of Diana Mitford, The Thirties Socialite. Originally printed in The Mitford Society: Vol. II.